With this fabulous selection of gift ideas ahead of Sunday 26th March, you’ll be spoiled for choice! What’s more, all these gifts are from Stockport-based businesses run by local ladies, so not only will you be getting the perfect gift, you’ll be supporting local businesses too! How about spending some quality time together, painting some pottery and chatting over a brew? Brooklyn Pottery is a family friendly pottery painting studio with a wide range of high quality pottery at purse friendly prices. There’s a great selection of quality pottery pieces ready for you to paint including: pottery animals, plates, mugs, trinket boxes and money boxes, pet bowls, New Baby keepsakes, photoframes and more. You can also enjoy a cup of tea or indulge yourself with one of their lovely cookies and a delicious Illy coffee! The studio is located at 104 Shaw Heath, Stockport SK2 6QS, next to Harry Bates and there is a free car park at the rear. Check out Brooklyn Pottery’s website here for opening times, or find them on Facebook. Why not treat your mum to one of Cake Creamery’s cake decorating classes for Mother’s Day or spend the day together making and decorating a cupcake bouquet? Cake Creamery, run by local mum Georgina, offers cake baking and decorating classes for all levels in Stockport. 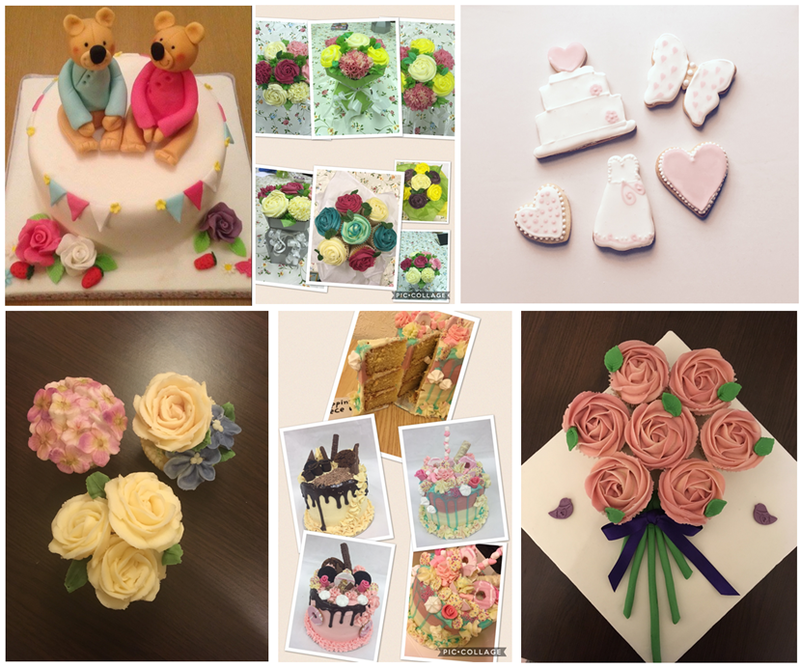 Upcoming courses include Beginners Cake Decorating Course, Make, Bake & Decorate Cupcake Class, Baking and Decorating Drippy Cakes and Cupcake Bouquet Decorating Class. For information on all classes and to book, visit www.cakecreamery.co.uk or the Facebook page www.facebook.com/Cakecreamerycourse where you can also see more gorgeous pictures of cakes made and decorated on previous courses! Bespoke solid silver fingerprint, handprint, footprint charms, jewellery and gifts from Daisy Imprints would make the perfect keepsake this Mother’s Day! Daisy Imprints was established in May 2008 by Amanda Briscall. Working from her home in Cheadle she specialises in solid silver fingerprint, handprint, footprint and animal prints charms, bangles, bracelets, cufflinks, necklaces, key rings, pictures and phone charms. Appointments can be made with Amanda for all items. Fingerprints need to be taken at an appointment with Amanda. Inkless wipe kits can be sent out for all other prints for you to take the prints yourself. A lot of Amanda’s work is through personal recommendation, she is very proud of her 5* reviews on Daisy Imprints’ Facebook page. The last orders for Mother’s Day will be taken by Amanda on Saturday 4th March at The Happy Potter in Bramhall Village Square, after that date Gift Vouchers will be available. For more information about this event click here. Please contact Amanda on 07963 906698, email amanda@daisyimprints.co.uk or message her through Daisy Imprints’ social media pages. How about treating mum to a conditioning treatment, scalp massage and blow wave? Lynn Evans has over 25 years experience in hairdressing. As Lynn is mobile and covers the whole of Stockport, her clients can have their hair done in the comfort of their own home! Perfect! Lynn is offering a fabulous Mother’s Day package this year – a conditioning treatment including a scalp massage and blow wave for just £15! A great opportunity for some TLC! For more information about Lynn’s services and to book, call 07779 935638, email her at hair4ubylynn@gmail.com or visit her Facebook page. Treat your mum to a personalised frame or gift handmade with love that would really mean something to her! 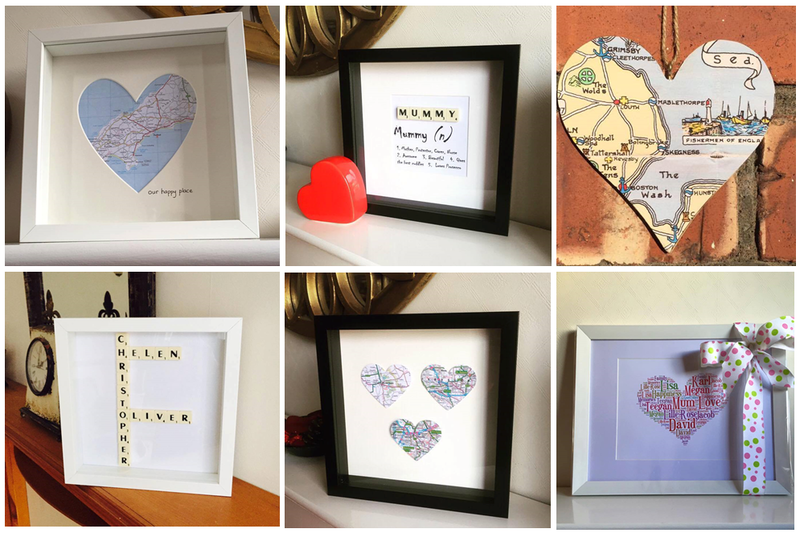 Offerton-based mum Jaxx set up Hearts and Flowers in 2015, in her words ‘making affordable gifts to make people happy’ (I can personally vouch for this having ordered a bespoke frame from my in-laws for Christmas – they were absolutely delighted!). Tel: 07834 604944 or send a message via Facebook here for more information. Limited edition, handmade beaded or resin jewellery made locally would make the perfect gift! Mel has been making custom designed jewellery and accessories since 2009. She works with glass, resin, acrylic and swarovski crystal beads to create custom designed jewellery for every occasion. All of Mel’s pieces are limited editions or one-offs and she loves nothing more than when a customer contacts her for a bespoke, custom-designed piece. Whatever your gift, or jewellery needs, Mel can create something perfect to match that outfit, accessory or special occasion! 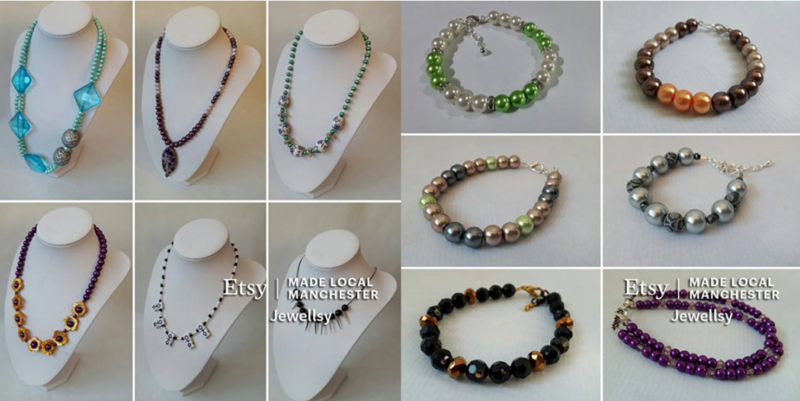 Visit Mel’s website here, or browse her Etsy shop here. You can also find Jewellsy on Facebook or visit Mel’s stall at the Heaton Moor Producers Market on the first Sunday of every month. No one would appreciate a bit of pampering and relaxation more than us mums! 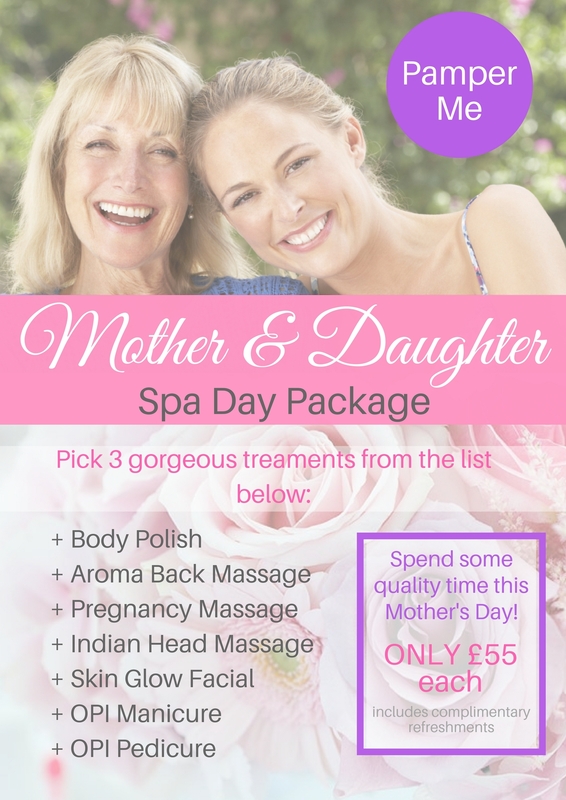 Pamper Me are offering the ultimate Mother & Daughter package this Mother’s Day, and what’s more, it’s fantastic value and right on our doorstep! Pamper Me is owned by local mum Jodie and is located at DRY, 15 Little Underbank, Stockport SK1 1LA. The salon offers a fantastic range of beauty treatments, and is within walking distance of a car park available for customers. Jodie and her team specialise in providing the ultimate in luxurious and professional treatments and you can be rest assured that your experience will be an indulgent and relaxing one: all therapists offer the same experience with scented candles, warm and cosy treatment rooms, soft lighting and calming music! If you’re thinking pampering is the way forward this Mother’s Day, but this package isn’t quite what you’re looking for, check out Pamper Me’s Facebook page, where they are forever posting fabulous offers and treatment ideas. Gift vouchers are also available to purchase! Specialising in converting children’s artwork into unique embroidered keepsakes, Sew Unique Artwork offer gifts that mums will cherish forever. 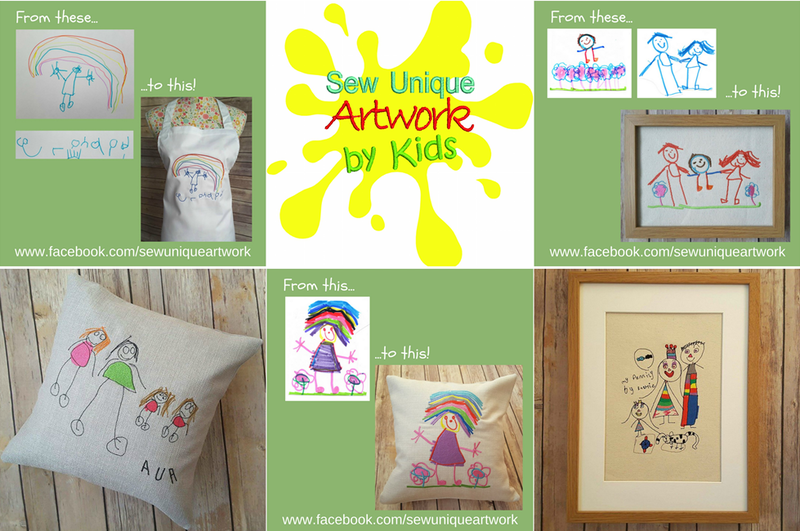 Sew Unique Artwork is run by Stockport Mum Kelly, turning children’s drawings into cushions, framed canvases, aprons, golf towels, ties, tea towels, t-shirts and more…any type of bespoke embroidery considered! Orders can be made by following the ‘Shop Now’ button on the Facebook page, which takes you directly to Kelly’s online Etsy shop. You can also see lots of examples of Sew Unique Artwork’s work on Instagram. To place an order, either scan a copy of your child’s drawing and email it to Kelly at sewuniqueartwork@outlook.com or take a good photograph of it on your smartphone (from directly above and ideally in natural daylight) and send it via Facebook messenger or WhatsApp it to 07960 988 036. All options are free and you get to keep the original drawing safely at home! The deadline for Mother’s Day orders is Sunday March 12th. This is the date by which a copy of your child’s drawing to work from would be needed. You can’t go wrong with cake – and you definitely can’t go wrong with cake from Scrum Lily Umptious! Scrum Lily Umptious was set up by Sharon in 2013 when she was on maternity leave, and she is now one of Stockport’s most in demand cake makers with her own shop on the A6. Sharon creates bespoke but affordable celebration cakes and cupcakes for all occasions, all designed with your theme and budget in mind. The deadline for Mother’s Day orders is Thursday 23rd March. Does your Mum deserve a bottle of Prosecco on Mother’s Day? The Alternative Wine Company is run by local Mum Tara, and with over 20 years experience in the wine trade it’s her mission is to help busy people find wines that they will really savour and enjoy. The Alternative Wine Company will deliver a bottle of our delicious La Delfina Prosecco direct to your Mum for just £11.75* including gift bag, personalised Mother’s Day gift tag and a raffia bow. What’s not to love?! If your Mum lives outside of the Company’s local delivery area, they can send a bottle in mail safe packaging to any address in the UK for just £16.75 (including personalised Mother’s Day gift tag). All wines are supplied with The Alternative Wine Company’s signature neck tag with tasting notes and food recommendations – and their personal guarantee that you (or your Mum!) will love them as much as they do – or they will refund or exchange them! Order online at www.thealternativewinecompany.co.uk or call Tara on 07885 691977 if you would like some help selecting the perfect wine for your Mum. The order deadline is Monday 20th March to guarantee delivery for Mother’s Day. *£11.75 offer is only applicable within our local delivery area i.e. within a 10 mile radius of SK4. A fantastic range of gifts including gift filled balloons, baskets, teddy bears, artificial flower boxes, glasses, mugs and candles with prices starting from just £3.99! The Balloon Baby is a small family run business based on Higher Hillgate in Stockport, offering a balloon and gift service to suit any budget and theme! The Balloon Baby will work closely with you to ensure all your needs are above and beyond what you had imagined, and have a great range of gifts available for Mother’s Day. Their gift filled balloons are treated to enhance their life span and can last for many weeks! Whatever you choose, you will be guaranteed a friendly welcome and service at The Balloon Baby. At the Balloon Baby you will also find a fabulous range of cards to go alongside your Mother’s Day gift. How about a beautiful handmade Fairy in a theme and design your mum will love? Local mum Victoria runs ToriStar Designs from home, creating personalised textile products including Baba Tags and blankets, and has recently launched her fabulous ToriStar Fairies range. Large fairies are just £10, and can be created in a design and theme of your choice. Victoria is soon to launch her Mother’s Day Special Edition Fairy which will come complete with a mini chalk board for your child to write their Mother’s Day message on! Take a look at some of Victoria’s work on her Facebook page. We are running a MEGA MOTHER’S DAY COMPETITION, where 13 lucky Mumblers will win a prize from one of the above businesses! Get all the details and enter the competition here. You won’t want to miss it!